This Wooden Organic Farm Set Has a Garden Space for Kids to Plant Real Seeds! There are certainly an overwhelming number of cool, eco-friendly building toys out there, but this working organic farm set may take the cake. The 145 piece set is comprised of sustainably harvested wood and features a windmill and a solar panel for generating electricity as well as a small garden space where kids can plant real seeds. The wood pieces are mainly neutral-colored and fit together like a sleeker, more modern version of Lincoln logs. The vibrant green roof and several exterior pieces, tinted with kid-friendly dyes, make for eye-popping and visually contrasting details. 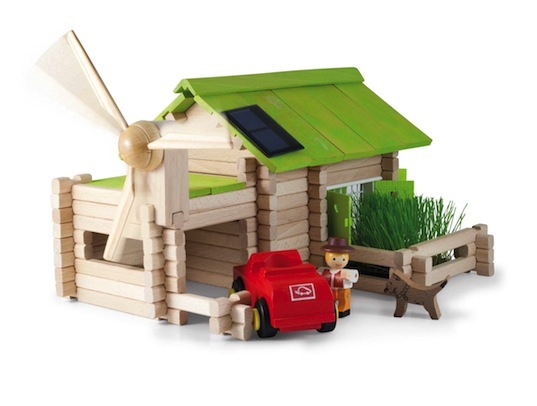 Designed for kids ages six to nine, this farm set is a great way to teach kids about sustainable farming and green construction.